ROYSE, Lemuel Willard, a Representative from Indiana; born near Pierceton, Kosciusko County, Ind., January 19, 1847; attended the common schools; studied law; was admitted to the bar in 1874 and commenced practice in Warsaw, Kosciusko County, Ind. 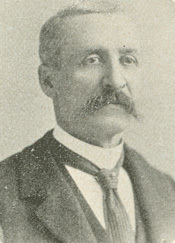 ; prosecuting attorney for the thirty-third judicial circuit of Indiana in 1876; mayor of Warsaw 1885-1891; member of the Republican State central committee from 1886 to 1890; delegate to the Republican National Convention in 1892; elected as a Republican to the Fifty-fourth and Fifty-fifth Congresses (March 4, 1895-March 3, 1899); chairman, Committee on Elections No. 2 (Fifty-fifth Congress); unsuccessful candidate for renomination in 1898; resumed the practice of law in Warsaw, Ind. ; judge of the Kosciusko County Circuit Court 1904-1908; resumed the practice of his profession; reelected circuit judge and served from 1920 to 1932; again resumed the practice of law until his retirement in 1940; died in Warsaw, Ind., December 18, 1946; interment in Oakwood Cemetery.